Southend United manager Phil Brown will reach four years at the club when his side visit AFC Wimbledon on Saturday. Paul Sturrock has changed his mind about to manage Southend in the Johnstone's Paint Trophy final at Wembley after he was sacked. Paul Sturrock has had a change of heart and turned down the chance to manage Southend United in the Johnstone's Paint Trophy final at Wembley. Chairman Ron Martin announced on Sunday that Sturrock had been sacked as boss of the Shrimpers but that, bizarrely, he would return to take charge for the final against Crewe on Sunday 7 April. A meeting with Southend United chairman Ron Martin at Manchester Airport swayed Phil Brown to become the club's new manager. Brown was preparing to travel for a coaching assignment in the South African townships, but chose to get back on the football manager treadmill. Watch Donovan Blake's report. Southend United's new manager Phil Brown revealed that he was asked about taking the job earlier in his managerial career. Brown, who was unveiled at a new conference at Roots Hall, said that the opportunity first came after losing his job at Hull City. "I spoke to the chairman Ron Martin three years ago when I was on gardening leave at Hull," Brown said. "I looked at the challenge then but wasn't sure about moving from the Premier League to a lower division. "But his ambitions for this club were clear for me then as they are now." Brown also confirmed that he'd spoken to former boss Paul Sturrock about the Johnstone's Paints Trophy Final at Wembley. "Strange things do happen in football. It's a subject that was broached to me when I spoke about the position," Brown added. Southend United Manager Phil Brown speaking at his first press conference this morning. 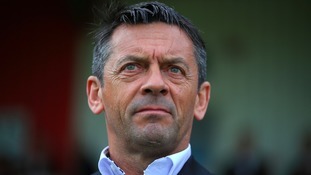 Southend have named Phil Brown as the successor to Paul Sturrock. Sturrock is still due to lead the team out for the Johnstone's Paint Trophy final against Crewe. Southend have confirmed Phil Brown's appointment as manager after it was revealed yesterday that Paul Sturrock would be leaving the club. The Shrimpers currently six points off the play-off places with seven games to play.